Showing results for tags 'anglican'. I will be taking weekly confession (secondlife only, no real life confessions as the sacrament/mystery would not be valid over the internet) for those so inclined to RP that aspect of their second life on Wednesdays from 7:30 PM SLT to 9:30 PM SLT. If you need a different date or time, send me a notecard or IM with your preferences. I am unavailable for dedicated confession from the hours of 6:00 AM SLT to 7:30 PM SLT M-F, but can be available all day Saturday and after 2:30 PM SLT on Sunday. (I'm in the Chicago [CST] time zone). Willing and able to perform SL Baptisms, First Confession, First Communion, Regular Confessions, Confirmation, Marriages, Last Rites, Unction (for the sick) or Last Rites, Funerals, and regular Mass / Holiday Mass or any other related ceremonies for fellow residents of Second Life. A couple days notice is preferred so that I can prepare, but I've always got the Prayer Book (1979 BCP) handy in a pinch. Donations grateful accepted for any of these, but never required. I would like to find a city to call home, preferably one with a Cathedral or large Church. I'm more than happy to help decorate, and would gladly pay rent for an adjacent parsonage. Please contact me in game at FatherTheo, or drop me a card if I'm offline. I've managed to get a job in game, but only a Linden granted home. I'm looking for a roleplay city that I can join, preferably one with a Church. I'd like a hut style parsonage (simple and not too large) which I'm more than happy to rent. 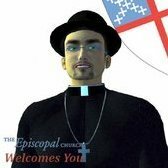 If there are any RP cities out there that could use a resident clergyman, please contact me here or in game. Thanks! I have just learned about this site and am curious and interested in learning and experiencing life here. Whats the the best way to begin?